Windows 7 Theme Soft7 SE who loves the semi transparent royal black glass effect on their desktop and Windows 7 PC. Very nicely crafted by the developer. 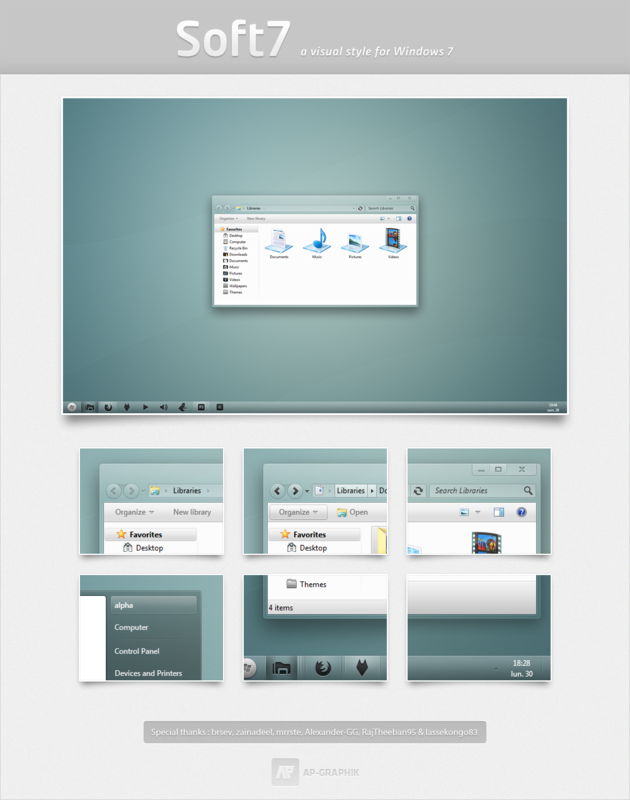 Windows 7 Theme Soft7 SE is created by ap-graphik. This is one of the great work by the developer. License : Some rights is reserved. It is licensed under a Creative Commons Attribution-Noncommercial-No Derivative Works 3.0 License. It is a RAR download, the file is 6.4 MB in size. This Article Has Been Shared 383 Times! Cite this article as: Abhishek Ghosh, "Windows 7 Theme Soft7 SE," in The Customize Windows, June 25, 2012, April 20, 2019, https://thecustomizewindows.com/2012/06/windows-7-theme-soft7-se/.